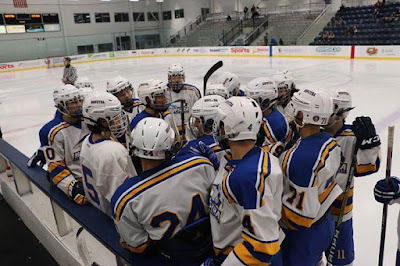 Hofstra Club Ice Hockey hosted the Kings Point Mariners at the Northwell Health Ice Center at Eisenhower Park on Saturday, November 12th. The first period was evenly played, with the Pride scoring first. The Mariners would answer and the first period ended with the score tied at one apiece. The second period was plagued with penalties, but despite the slower play, the Pride would score twice to take a 3-1 lead into the final period of play. The third period proved to be erratic and unpredictable. The Mariners flew out of the gates to score three goals and take a 4-3 lead. The Pride wouldn’t fold, and fought to keep the score even. With the game tied at 7, Hofstra and Kings Point headed to overtime. Only 23 seconds into the overtime period, Joe Grice was able to put one by the Mariners’ goalie for his fifth goal to secure the 8-7 victory for the Pride. Hofstra Club Ice Hockey team with some last minute pre-instructions. 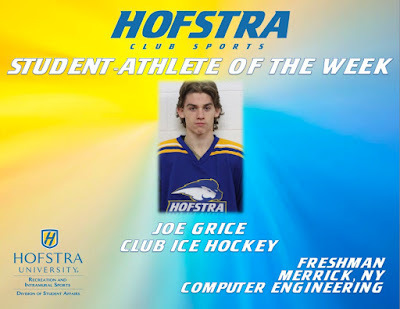 PC: Hofstra Ice Hockey on Facebook. Hofstra Women’s Club Ultimate Frisbee traveled to Newtown, Pennsylvania to participate in a tournament on Saturday, November 12th and Sunday, November 13th. On Saturday, the Pride lost to The College of New Jersey, 12-10, University of Valley Forge, 11-4, and the University of Rochester, 12-4. On the first day of the tournament, Hofstra managed to best Princeton University’s B team by a score of 12-2. The second day of the tournament fared much better for the Pride. Hofstra was able to beat Rowan University, 13-1, Northeastern University, 13-1, and The College of New Jersey, 8-5. This was the final tournament for Hofstra during the fall semester and the team is looking forward to the upcoming spring season. Hofstra Women's Club Ultimate Frisbee after their tournament in Newtown, PA on Sunday, November 13th. Hofstra Club Quidditch ventured out east to Stony Brook University on Sunday, November 13th to compete in the “Officially BAQC At It” tournament. Hofstra was able to pull out victories against Macaulay Honors College at CUNY, 90-70*, and against New York University, 100-50*, (*indicates a snitch catch). Stephen Daly stood out for the Pride by scoring 60 total goals throughout the tournament. Hofstra Club Softball played their first ever home series against the University of Connecticut at Bill Edwards Stadium, here at Hofstra University, on Sunday, November 13th. The Huskies and the Pride would split the first two games of their triple-header, with UConn winning the first 13-3, and Hofstra winning the second 11-8. In the rubber game of the series, UConn would come out victorious scoring eight runs in the top of the seventh inning to put the game away, winning 10-1. In their first ever home series, the Pride took on the Huskies of UConn in a triple-header at Bill Edwards Stadium, Hofstra University, Hempstead, NY on Sunday, November 13th. PC: Martin Beer. Hofstra Club Equestrian competed in the LIU Post Horse Show at the North Shore Equestrian Center in Greenvale, New York on Sunday, November 13th. Captain Maria Sorrentino placed 6th in both over fences and in flat class. Captain Kate Milford had a beautiful ride over fences, earning a 3rd place finish in her class. Walk trot canter riders, Meghan Tierney and Katie Tomasino, both had great rides in their classes, Tierney placed 6th in her class. In Hofstra’s thrilling 8-7 victory over Kings Point, Grice scored 5 goals, including the game winner just 23 seconds into overtime.